It's sweltering outside. But on a hot Monday evening, the coolest place to be is at The Urban Lounge, where The Hold Steady is belting out tunes like "Positive Jam" and "Sequestered in Memphis" to a frenzied throng of the New York-based band's devotees. The second-coolest place to be on the same Monday night is Rye Diner & Drinks. A not-so-thick wall is all that separates The Urban Lounge and Rye, the latter of which was recently opened by Urban Lounge owners Chris Wright, Lance Saunders and Will Sartain in the space that formerly housed Al Forno's Italian Ristorante. The proximity of Rye to The Urban Lounge means that you don't need a ticket to enjoy Urban Lounge concerts; they come blasting right through the walls of the restaurant. You know you're a geezer whose hipster cred has crumbled when your Rye waitress says to you and your wife, "You guys should come when someone mellow is playing. It's fun!" Rye Diner & Drinks has a look and feel that would be well-suited to trendy up-and-coming neighborhoods like Williamsburg in Brooklyn or Los Angeles' Silver Lake. It's a sparse, minimalist rectangle with a bar/counter in the back and a series of small booths in the main dining room, which is split in half by a waist-high partition separating a space that, during daytime, is home to the diner's barista and breakfast patrons. Currently, Rye offers breakfast and dinner menus only, but a lunch menu is in the works. The servers are young and hip: plenty of tats, and clad most often in shorts (albeit frequently paired with dress shirts and bowties). Service at Rye is genuinely friendly, sincere and professional, headed up by former Mazza manager Samantha Starr. At the helm in the kitchen is Tommy Nguyen, formerly of Takashi, who has assembled one of the simplest, yet most satisfying, restaurant menus I've encountered in a long time. At breakfast, the menu features a series of soft egg "scrambles" with potatoes and toast, ranging from $7 to $10, with ingredient choices like chives and creme fraiche; bacon, spinach and Gruyere; Brie and mushrooms; tofu with tomato, spinach and avocado; and more. There's also vegan hash ($8) available (fingerling potatoes, Brussels sprouts, tempeh, onion and peppers), coconut quinoa with pecans and fruit ($6), buttermilk pancakes with whiskey maple syrup (made with Elijah Craig Kentucky Bourbon), brioche French toast with lemon curd ($9), and the waffle & whiskey ($8): a waffle with whiskey syrup and optional upgrades like an egg cooked to order ($2) and pork belly ($4). As appealing as the breakfast menu is, it's the nighttime dishes that really rocked me. The dinner menu—a mere dozen or so dishes—is divided into a handful of small-plates items and seven or eight entree-style options. Incredibly, the prices top out at just $15 for the steak and fries (more about them later). The small plates are small in name only, with plenty of food for two or three to share. Generous portions and thrifty pricing seems to be de rigueur at Rye. A plate of five "street dumplings" ($7) is an absolute must. These gorgeous, plump, housemade pot stickers, stuffed with minced pork, shrimp, garlic and chives and served in a salty/tangy/citrus soy vinaigrette with fresh ginger and chopped scallions are simply stupendous. I wish the dumplings came as an even half-dozen so couples don't have to fight over the fifth one. There's an asparagus dish at Rye that could serve as a sharable side dish or appetizer and it, too, is superb: a plate of intact asparagus tips, along with thinly shaved stalks, shallots, lemon juice, shaved Parmesan and a coddled egg ($9). As with so many of chef Nguyen's creations, it's mind-bending that something so simple could be so sensational. Before I'd gotten my lips around Thomas Keller's now-famous buttermilk fried chicken at Ad Hoc, the best fried chicken I'd ever tasted was the 100-spice chicken at the now-defunct Lola in New York City. Well, I can securely place Nguyen's shoyu fried chicken ($10/quarter or $15/half) in the top three of my all-time favorite fried-chicken list—and, on a good day, it might just clock in at No. 1. Again, there's seemingly nothing complicated about this dish. It's just chicken parts—marinated or brined, I suspect—in a soy-based sauce that lends plenty of salt to the proceedings but also deeply flavors and tenderizes the chicken and gives it a light-brown hue. Beautifully crispy skin gives way to impossibly tender meat, and the chicken comes with an unbeatable side of Asian-inspired coleslaw tossed in a light sesame-oil-based dressing. Frankly, I wasn't expecting much from Rye's take on steak frites. After all, it's been done to death, right? Wrong. For 15 smackers, the teres major steak has to be SLC's best beef bargain. Teres major is similar in size and texture to pork tenderloin, sometimes also called a beef petite tender. Mine was cooked exactly medium-rare as ordered, oh-so tender, cut into juicy medallions, and seasoned with thyme and garlic butter. I was bowled over not only by that perfect steak, but also by the mountain of equally perfect french fries that accompanied it, kissed by spicy togarashi seasoning and served with roasted-garlic aioli. But wait, it gets better: Rye is open until midnight Sunday through Thursday and until 2 a.m. on weekends. 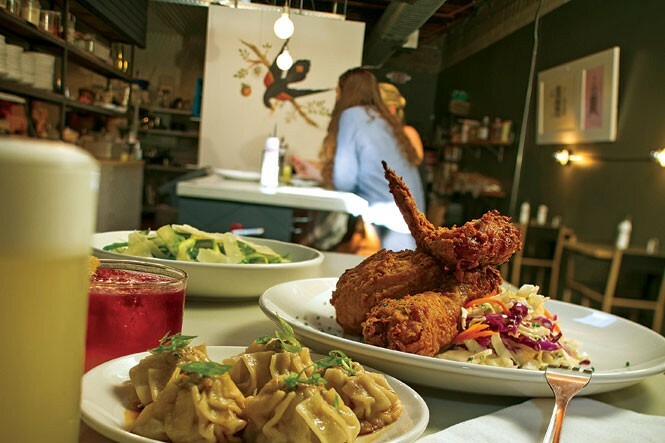 With Rye, Salt Lake City's casual dining scene has taken a leap into hyperspace.